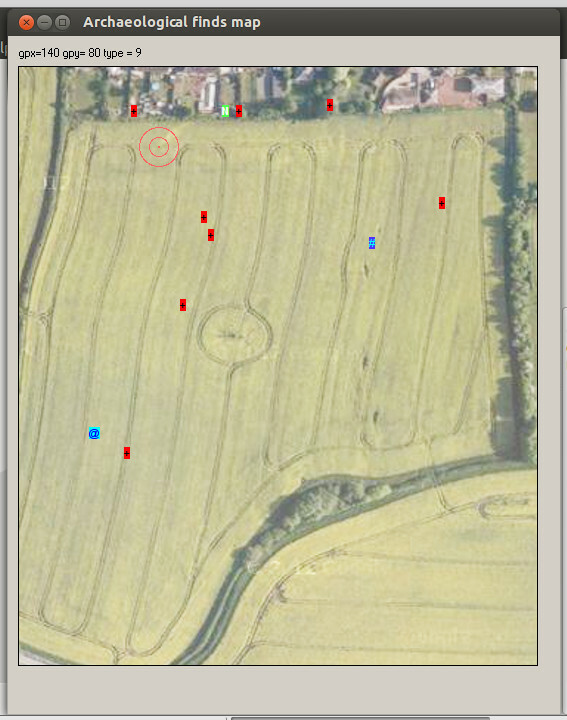 Mapping metal-detector field data as map overlay. Just add data at the end and the program maps and colour-codes/annotates each site (whose GPS coordinates have been recorded along with the tentative description/dating). I've simply shifted/scaled the GPS Northings and Eastings so they fit the graphic window I've used. For serious use the map ( I used a Google maps grab) needs to be properly scaled and positioned. #demo.gb1 "down ; size 1"
#demo.gb1 "font arial 8 bold"
#demo.gb1 "drawbmp map 0 0"
#demo.gb1 "color 0 0 0 ;   backcolor red ;\+"
#demo.gb1 "color 0 0 255 ; backcolor cyan ;\@"
#demo.gb1 "color cyan ;    backcolor 80 50 255 ;\#"
#demo.gb1 "color 255 100 100 ; circle 1 ; circle 10 ; circle 20"
#demo.gb1 "color white ;   backcolor 80 255 80 ;\N"
'timer 200, [continue]                       '   <<<<< Without the delay the screen items are not drawn! DATA 0,  17523, 90741    '1d 1924 ? data 999, 999, 999      '   sentinel to show all data has been read. As always, feel free to email me for help..